I wish I could bottle up the sound of my children’s deep belly giggles. It would be that special cure for those days when nothing seems to go right. 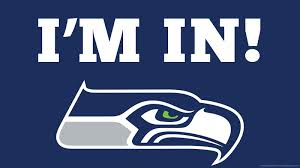 Being a Washington native, you can hardly turn on the TV without seeing some mention of the Hawks. It has been an incredible season and I’m so happy to see them in the big game for the 2nd year in a row. Go Hawks! Our new house is still under construction and won’t be done until summer. I am a very lucky girl to get a little reading corner in our master. You know….the room with the AMAZING mountain views. The doors are up and whether they are open or closed, it’s going to be one of my favorite spots in the whole house. For now, I’ll just have to curl up with my Kindle at night….in the dark….with a little book light….while trying NOT to wake the hubs as I read myself to sleep. We had the most glorious day of sunshine last week. It may have only been 50 degrees, but it was warm enough to take both kids outside to play. My son enjoyed a short little stroller ride as my daughter had time to ride her trike and scooter around the neighborhood. Now I’ve got that itch to get some stroller walks in with the kiddos. I just need the sun to come back and play awhile! I am running out of ideas for meals. I feel like we’ve gone through the same 10-12 meals over and over and over again. Don’t get me wrong, they are our favorite recipes, but I need to put a little life back into meal time. I’m sure this qualifies as a need to browse Pinterest….right? A hoodie really is a great choice for many occasions. With the cold weather, I’ve actually been wearing one while playing soccer, too. Did I mention I play INDOOR soccer? If the day ends in y, I’ll wear a hoodie. There are a few places I won’t wear one (wedding, interview, etc. ), but when I come home, I’ll slip into one once again. I love hoodies! Head over to Farley’s blog to see what everyone else is up to! I also want our SUNSHINE back! I'm in Texas and it has been rainy the past couple days. I thrive on sunshine! I just planned out our weekly menu for the week and I get stuck serving the same things. My kids are pretty good eaters but they definitely have their favorite meals so I tend to make those over and over! Thanks for sharing, your blog is super cute! How exciting that you're building a new home! Congrats! We just moved some furniture around in our bedroom to make ourselves a little reading nook (TV watching nook for my husband, lol). For recipes, I'm in the same slump! I make a lot from the blog 100 days of real food. Lots of easy, family friendly recipes! I'm am 100% jealous of your mountain view and soon to be reading corner. Enjoy every second of it as I live vicariously through you!